There are two kinds of watches. Actually, there are about 100 different kinds of two kinds of watches. But the first of the two kinds that I want to mention here, so that I can zero in on just one kind, are those watches that are supposed to blend with your outfit. You know the kind I'm talking about: thin, subtle, shyly peeking out from under your sleeve. Then there are the bolder watches that take you places not safe for ordinary mortals. Harry Winston makes those kind of watches, for example — exciting and fearless. pieces. Photo from Romain Jerome. So does the less famous Swiss watchmaker Romain Jerome, whose steampunk tourbillon watches epitomize the word bold. Tourbillons, while expensive, are no longer the white tigers of the watch world, rarely seen, and generating oohs and ahhs whenever they are spotted. But they’re still engineering marvels, and very, very hard to make. A tourbillon is a special feature that's added to watches to improve accuracy. The mechanical gears of a normal watch are affected by the watch’s position relative to the direction of gravity. When your watch is by your side — when you’re walking, for example — it runs at a different speed than when it is horizontal, such as when your head is resting on your arm as you sleep at your desk at work. There’s no way to regulate a wristwatch that’s randomly assuming different positions relative to the direction of gravity. (An aside: pocket watches of old were easier to regulate because they spent most of their time in one position.) A tourbillon compensates for the varying effects of position by putting a watch’s escapement and balance wheel inside a rotating cage that’s in constant motion. The changes in accuracy that occur when the watch is in different positions are cancelled out because the escapement and balance wheel are always moving. Watchmakers usually make the watch face above the tourbillon clear so that you can see the tourbillon moving. Although it’s been around since Abraham-Louis Breguet invented the tourbillon in 1795, it’s still cool to see a tourbillon in action. and costs $130,000...if you're lucky enough to find one. 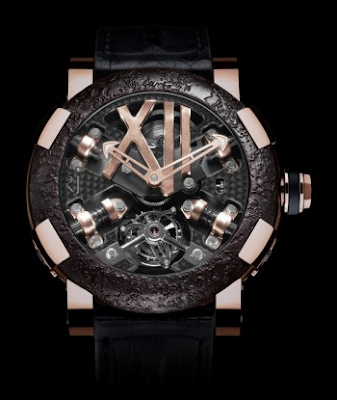 What’s even cooler is when a watchmaker designs a watch that transports that 1795 creation into another era, as Romain Jerome has done with their steampunk tourbillons. In these watches, steampunk, an imaginary technology in which everything is powered by the kind of steam machines that gave oomph to 19th-century industry, is married to the tourbillon, a technology that’s 200 years old and constantly being refined. Steampunk tourbillons look like they were made from technologies that existed both in an alternate past that never happened and the future that hasn’t happened yet. They’re feasts that your eyes won’t want to let go of. My favorite Romain Jerome steampunk tourbillon is the Gunmetal version, a 50 mm watch in a PVD-coated steel and titanium case. 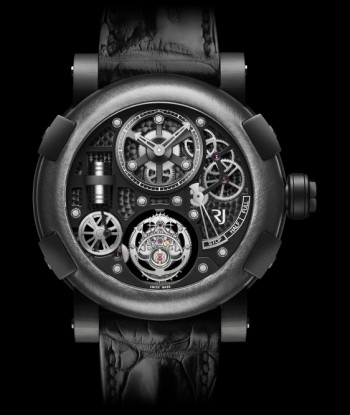 It has a sapphire caseback, 36 jewels, oscillates at 28,800 vph, and has a 48-hour power reserve. 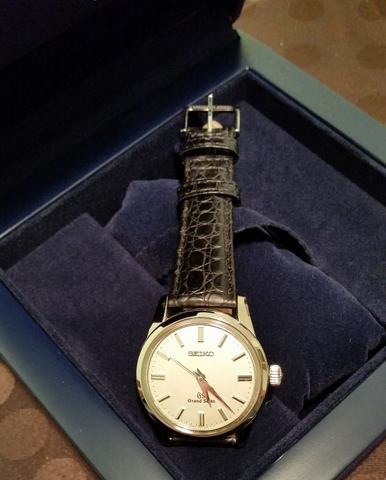 The watch costs about $70,000. It’s okay to whistle at the mention of $70,000. If you want to see what creativity and engineering at their finest are like, take a look at the Romain Jerome steampunk tourbillon, where engineering meets science fiction on a watch.